Bats are often misunderstood creatures, portrayed as blood-sucking vampires on the television screen and in our Halloween decorations. But these flying mammals are actually great allies in our environment, aiding in pest control, pollination, and seed dispersal. In fact, one bat can consume over 600 mosquitoes in one hour! 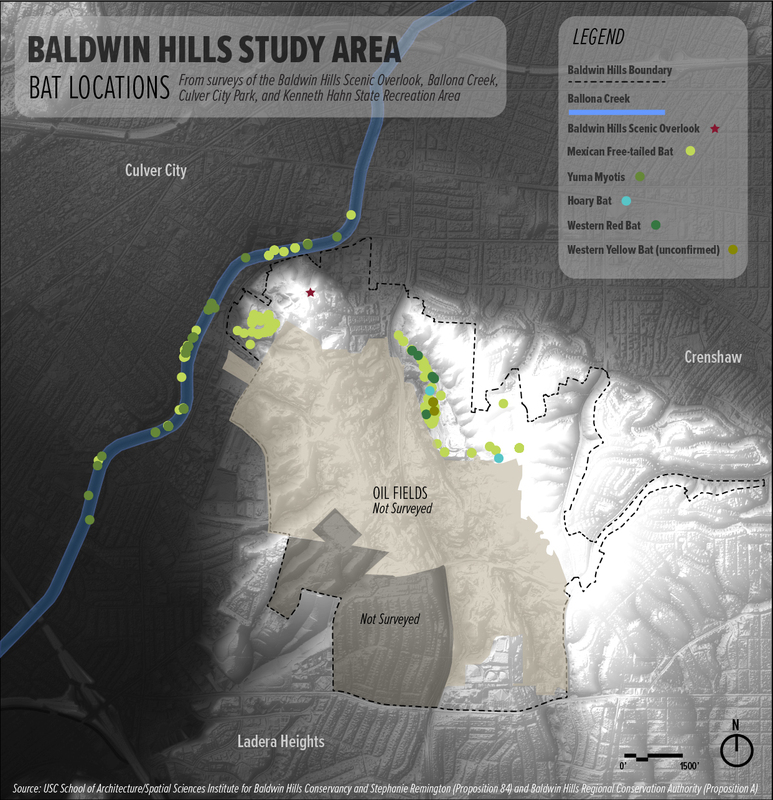 Recent surveys have confirmed four bat species living and feeding in the Baldwin Hills out of the 24 species confirmed to occupy Los Angeles County. Previous surveys and historical museum records have also documented additional species occurring in or around the Baldwin Hills area, indicating additional species may exist or may have previously existed in this area. In general, bat populations have been in decline in California as their habitat has been lost to urban development, mosquito abatement programs that have reduced the bats’ food source, and nighttime lighting that has affected insect distributions. For these reasons, the Baldwin Hills has particular significance as a roosting and foraging habitat for the species that occupy the area and the other 20 bat species that call LA home. Like most bats, the Mexican Free-tailed bat is nocturnal, hunting for insects like mosquitoes, moths, and other small flying insects at sundown. In the 2014-2015 survey of bats in the Baldwin Hills, researchers found this bat to be the most commonly recorded. One reason for its dominance, is its low frequency and loud echolocation call which is easily recorded and identified compared to other species with quieter calls. The Mexican Free-tailed bat can be found near Ballona Creek, Culver City Park, and Kenneth Hahn State Recreation Area. The Hoary bat is another commonly found bat in California, though it was only confirmed once in the recent Baldwin Hills survey. This bat is a solitary mammal that specializes in foraging for moths and often roosts in the foliage of trees. The one confirmed recording of the Hoary bat during the past survey occurred in Kenneth Hahn State Recreation Area. The Yuma bat was the second most commonly recorded bat during the survey. This bat typically forages for flying insects around water bodies such as ponds and creeks. Accordingly, the Yuma bat was only recorded along the Ballona Creek during the survey. Though its presence was not confirmed in Kenneth Hahn State Recreation Area, it is possible this bat could also be found near the various ponds in the park if the insects are abundant. The Western red bat is considered a Species of Special Concern by the California Department of Fish and Wildlife. Similar to the Hoary bat, the Western red bat is a solitary creature that tends to live and forage in riparian areas which tend to be scarce in the Baldwin Hills. This species was recorded in Kenneth Hahn State Recreation Area near one of the ponds that contains adjacent riparian vegetation. There have been possible recordings of this bat in Kenneth Hahn State Recreation Area, though its presence is unconfirmed. During the survey, calls were recorded that are believed to be from the Western Yellow Bat, however further investigation is necessary. It is currently listed as a California Species of Special Concern. 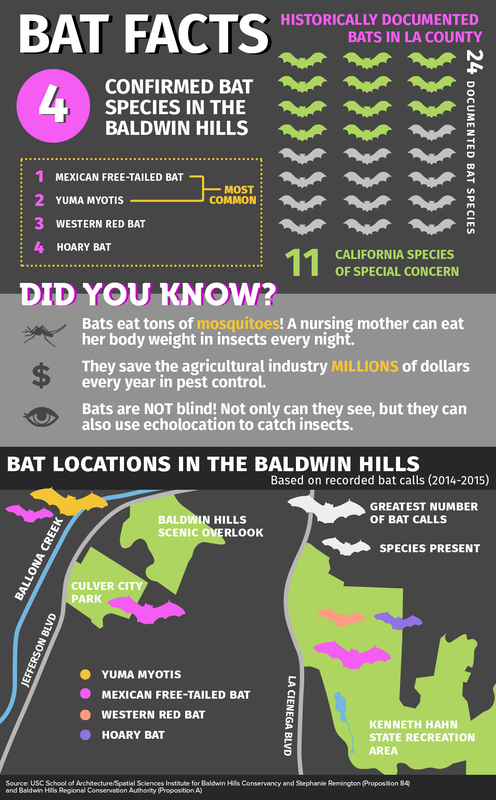 Visit our Baldwin Hills mammals guide on iNaturalist to view our full list of confirmed bats. Tadarida brasiliensis: Brazilian Free-Tailed Bat. Animal Diversity Web. Lasiurus cinereus: Hoary Bat. Animal Diversity Web. Lasiurus blossevillii: Western Red Bat. Animal Diversity Web. Myotis yumanenis: Yuma Myotis. Animal Diversity Web. Special Animals List. California Department of Fish and Wildlife. July 2016.